16 LISTS Uncommon AfflictionsFascinating conditions, devastating disorders, and nightmarish syndromes that affect human bodies. Images of individuals with progeria are arresting: they show young children who resemble people in the advanced stages of age, complete with bald heads and wrinkled skin. But what is progeria? Also known as Hutchinson-Gilford progeria syndrome, this genetic condition causes rapid, premature aging, both in a child's physical appearance and overall health. There are many things to know about progeria, but first, it's crucial to understand how rare it is. The condition impacts only about one in 8 million people, and that fact - combined with its dramatic effects - leads to many misconceptions about it. It may seem like a scary disease, but its not contagious. The people who live with it are just people, albeit ones who look a bit different. 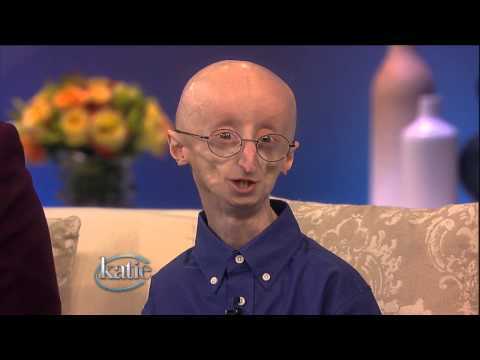 Can someone live with progeria, and is there a cure for this seemingly unexplainable disease? Scientists haven't been able to treat progeria yet, but new facts and information point to hope for the future. Because progeria is a genetic condition, many people assume that it's inherited. Actually, the gene mutation involved in progeria usually happens spontaneously. Progeria is a "sporadic autosomal dominant" mutation, which means it's new to the family, and that only one copy of the mutation is required for the condition to arise. Parents who have never had a child with progeria have a one in 20 million chance of having a child with the syndrome. However, parents who already have one child with progeria have a 2 to 3% chance of having another. That increase in the odds is due to something called mosaicism. Essentially, parents now have the genetic mutation for progeria in some of their cells. Parents in this situation can get prenatal testing to detect the genetic change that causes progeria. Progeria is colloquially known as a rapid aging disease because the typical symptoms strongly resemble the aging process. These symptoms include decreased growth, loss of body fat and hair, wrinkled skin, stiff joints, hip dislocation, and heart disease. However, not all symptoms of the aging process are present in progeria patients. They don't generally get cancers, Alzheimer's, or cataracts at a higher rate than the general population. Their maturity levels are also consistent with their chronological age. In other words, these are still kids. What exactly causes this extreme effect? Progeria is thought to be caused by a genetic mutation that impacts protein development and weakens cells, leading to an accelerated aging process. People with progeria are at high risk for strokes, high blood pressure, and heart failure - all conditions associated with the aging process. Heart disease presents the biggest risk for progeria patients, and cardiovascular issues are frequently the cause of death for them. While it is possible for progeria patients to live into their 20s, the average age of passing is about 13 years old. Typically, death occurs because of a heart attack or a stroke. As research continues, this low life expectancy will hopefully go up. 'Zombie Deer Disease' Has Been Reported In 22 States, But Could The Virus Spread To Humans?